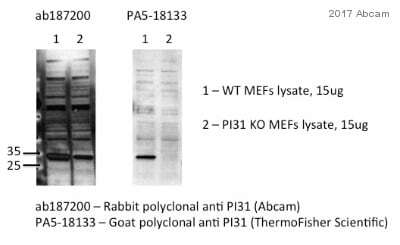 Recombinant full length protein corresponding to Human PSMF1 aa 1-271. SW480, A549 and K562 cell extracts; Mouse liver and testis tissue extracts. Our Abpromise guarantee covers the use of ab187200 in the following tested applications. WB 1/500 - 1/2000. Predicted molecular weight: 30 kDa. ab18720 Immunohistochemistry of paraffin-embedded human liver injury using PSMF1 antibody at dilution of 1:100 (x40 lens). ab187200 has not yet been referenced specifically in any publications. Publishing research using ab187200? Please let us know so that we can cite the reference in this datasheet.